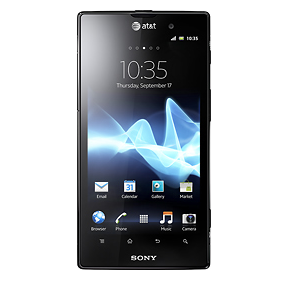 The Sony Xperia Ion, which we first saw back at CES (and later saw as an AT&T exclusive device), while not a flagship superphone, is definitely a decent device – it packs a dual-core snapdragon processor at 1.5GHz, a 4.55" LCD display at 720x1280 (~323ppi), 1GB RAM, and a 1900mAh battery. If you like the looks of the Ion but are still waiting for just the right deal before pulling the trigger, this is it. 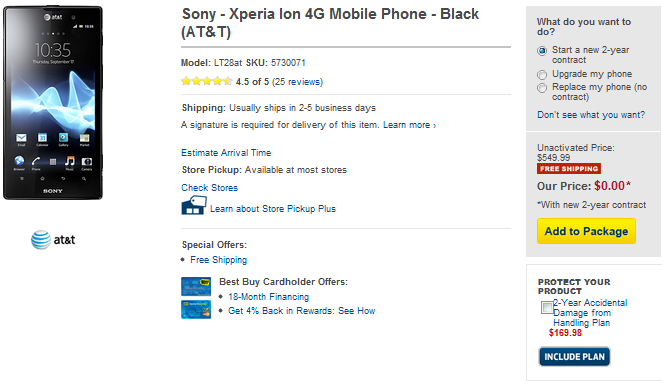 Best Buy is offering the Ion for exactly $0.00 with new 2-year contract or upgrade plus free shipping. Those inclined to buy from Amazon Wireless can still get the phone at a deeply discounted rate of just $30.00. Considering that AT&T is still selling the Ion at $99.99 on a new two-year contract, both of these deals are great opportunities to get a decent device at a discount. If you're in the market for a free (or very inexpensive) phone with reasonable specs and don't mind running Gingerbread until the Ion gets its ICS update (fingers crossed), just hit one of the links below to take advantage of the deals.